This is my personal guide to Masako Kinoshita’s Loop-Manipulation Braiding Research and Information Center news, issues 1-13, plus its associated Illustrated Instruction series. This guide is like a table-of-contents for each issue, rather than an index. L-MBRIC’s own index is at the bottom of LMBRIC no. 13. Read more about L-MBRIC and why it is such an amazing resource in the endnote below this guide. Links will open in a separate window, so this index can remain available. Introductory/ Home page, with links to each of the thirteen L-MBRIC issues, but no “table of contents” of their articles or topics, and no links to the parallel Illustrated Instruction series that accompanies them. The contents of issues #1 to 13 are briefly itemized below the following two stand-alone Illustrated Instruction issues. Note: Most LMBRIC issues and some of the Illustrated Instruction issues have a separate page of references/bibliography notes. I include a link to the reference page immediately after the list of articles in each issue. Japanese 日本語版 and English versions: Each L-MBRIC issue has a link to the Japanese or English language version at the top of the page. For example, click on “Nihongo-ban” in any English issue’s header to go to the Japanese version. However, the Illustrated Instruction issues do not include these links to their Japanese/ English language equivalents, so in the guide below I include a link to the Japanese version immediately following the link to the English version (only for the Illustrated Instruction series). This section deals with interconnection of two braids by two braiders who sit side-by-side. 1. Connecting the two braids by loop interchange at nearest neighbors using 10 loops. 2. Connecting the two braids by loop interchange at [both nearest and] farthest selvedges, using 10 loops – tubular couvert or compound braid when done with bicolor loops – color photos of examples. 3. Connecting the two braids by loop passing between nearest neighbors, 9-loop braid. MATERIALS; Preparation of the loops and kute [handles]; FOUR MODES OF LOOP TRANSFERS – A,B,C,D; PRACTICAL ADVICE: How to transfer a loop; BRAIDS RECONSTRUCTED FROM THE EARLY NINETEENTH-CENTURY RECORDS: 2-step procedures [having two main braiding moves, like square braids]; and 4-step procedures [having 4 main braiding moves, by which a single braider can create very novel braids, for example two square braids or 4 thin flat braids made simultaneously; a “double” braid of two square braids joined together vertically; the genji-uchi braid; more]; SUPPLEMENTARY BASIC MANIPULATIONS F and G [Four ‘extra’ moves (E,F,G,Z) were not explicitly taught in the old Japanese manuscripts, but deduced by Kinoshita from examining actual surviving braid artifacts – here she describes two of them. ]; Notes and references. L-MBRIC no. 1, 1998 – Loop braiding historical background and references, incl 1st C. BCE bronze Chinese figures loop braiding (more details in LMBRIC no.3), medieval European fresco (more on this fresco in LMBRIC no.4), illustration from India showing Method 2 (V-fell); Notes and references. Materials used for braiding; Preparation of the loops; Finger-held L-M and Hand-held L-M; the three distinctive methods in the F-H L-M; Terms used in illustrated instructions; Braids with an Orthodox Pattern; Braids with an Unorthodox Pattern, FIVE STEPS OF F-H L-M procedure; Track-Plans; Notes and references. L-M BRIC no. 2, 1999 – Panama, Columbia, Siberia; Notes and references. 7-LOOP SPIRIT BRIDGE; Burial String TYPE I of Cuna Indian in Colombia (5-loop square braid); Burial String TYPE II of Cuna Indian in Colombia; UO No. 1 [Unorthodox braid no.1] using method #1; using method #2; Closure string of a jacket of the Khanty tribe of Siberia – method 1, method 2. L-M BRIC no. 3, 2000 – ‘Fingerloop’ Braids from the 12th – 15th-c. Dump Sites in London, UK. ; L-M BRAIDING in China from the First Century BC (bronze figures); L-M Braiding of THAI Minority People the KARENS and the AKHAS; “OLD ENGLISH PATTERN BOOKS FOR LOOP BRAIDING” by NOÉMI SPEISER; note 7); Notes and references. Track plans and hand diagrams for four more 5-loop basic braids. L-M BRIC no. 4, 2001 – Lace as a loop braiding technique (Catherine Wheel; Lace Maskell & Frettys; Uppsala Sudary insertion; Das Lintwurm Portlein; English lace insertions in 2 Portuguese copes), new openwork braid manuscripts found, one in German; 13th C. fresco: the ‘Haus zur Kunkel (House of Distaff)’ in Constance, Germany, shows two women apparently loop braiding (shown also in LMBRIC no.1)–new information re translation of old German word ‘dringen’ in fresco; [my note: Re lace/ openwork, see also L-M BRIC no. 9 for photo of an Indonesian loop-braided lace insertion, made by three braiders working together]; Notes and references. L-M BRIC no.5, 2002 – 2 types of Single-Course Twining made by loops – Type 1 = ‘woven’, and Type 2 SCOT = braided (single-course oblique twining); The Hunzas of northern Pakistan make 8-ridge Type 1 twining for the edge trimming of a cap… they also make a 10-ridge version using all ten fingers… The Hunza type 1 [woven-type] edge trimmings made by L-M [loops] always have 2-ply twines of S- and Z-twist next each other; SCOT Braids from Fifth-century Japanese Burial Mounds by Mari Omura et al; The Yaos in Thailand..braids used for edge trimmings of caps, clothes, bags and bridal saddle blankets…also for button loops; The L-M used in India has been found to be ‘inner-finger operated’ method; Mystery of a Beater Stand Illustrated on the Face of a Cypress-strip Fan; About Single Course Twining (with 2 Sets of Elements; Single Course Oblique Twining (SCOT); Ancient Japanese SCOT braids and Kute-uchi) Notes and references. L-M BRIC no.6, 2003 – L-m braids ca. 1630-40, Found at Rosenborg Castle, Copenhagen (link to separately hosted article); Family Tradition of L-M Braiding Kept in Aomori, Japan by Mrs. Kumeda (finger-held loop braiding, not hand-held); Loop braiding beater stands: in early 19th-c. picture of a loop braider in Egypt; discussion and/or images of beater stands in Bulgaria, Morocco, Japan; Loop-Braiding Text from Karlsruhe, Germany; loop braiding in Finland; Notes and references. L-M BRIC no. 7, 2004 – Bronze Age loop braid found in Middle East archaeological site; Fragments of Tortoise Shell Design Braids Proving the Practice of the Procedure Proposed by N. Speiser; Tortoise-shell-pattern (kikko) braids; Braids on Relic Purses in Sion, Switzerland (unusual loop exchange); 17th-century specimen found fr Denmark or Northern Germany; Florentine fresco shows loop-manipulation warp-twining; Edge Trimmings on the Llangorse Textile from Wales – Tablet Woven or Loop Braided (2-loop braids)? Notes and references. Single-face Tortoise-shell Design Braids (single-faced Kikko braids): 3 different loop-braiding methods (kute-uchi), also references to kumihimo (stand-and-bobbin) methods, as well as pictures of double-faced kikko. L-M BRIC no. 8, 2005 – Braiding Instructions Found in a 17th-C. Printed Book: “Nature Unbowelled” aka “the Serene”; Unorthodox braid patterns in English records; Sulawesi, Indonesia loop braiding, part 1 of 3 (cont. in issue 9); Notes and references. Two-person couvert and compound braids compared between the Tollemach manuscript and the newly-discovered Serene (‘Nature unbowelled’) manuscript. Kumihimo comparisons to Shiguchi and Mitake-kumi. In the Serene, the methods of covert and compound braid making are applied to 3 more types of two-person twill braids than in the Tellemach manuscript. (described and diagrammed with hand-loop illustrations). Article (link) by Joy Boutrup on the braided seal strings on a 1590 Danish royal marriage document; Report from Quinghai, Northwestern China 7-9th C. “…braid trimmed over seam lines of a slipper”; L-M braiding in Ecuador and in Ethiopia; Braid making for a replica of a Japanese national treasure laced armor (1185-1333 CE) by Chizuru Nishioka – used hand-held loop braiding, using a braiding frame for providing “extra hands”; Report from Frieda Sorber: Braids on a 5th-7th C. Central Asian purse, a European loop braided seal string from 1253, loop braiding documented in Morocco and Tunisia, illustration of two women loop braiding seen in an old Greek weaving book, Turkish example seen; Report by Mari Omura on the international Symposium “Handling Carriage Horses like Braiding” held in conjunction with The Gangoji Temple Special Exhibition of the same title (see LMBRIC no. 10 and 11 for more details on recent historical findings on loop braiding in Asia); Notes and references. 1. Sulawesi basic method 2 (V-fell) loop braiding, for making the “trinity”: divided, square, and flat braids. 2. Braids used in Sulawesi as carry straps and edgings for bags. a. Carry-strap has solid area that divides into two thinner braids at each end. These are threaded through the wide, flat edging braid along the upper edge of the bag. b. The wide, flat braided edging is braided with multiple short slits through which the braided carry-cord/ handles can be threaded. [Instructions for both a and b, and photo which can be enlarged to show details – great bag design, similar to certain medieval European purses, but with additional element of an edging braided with holes for drawstrings to be threaded through. Instructions are not necessary if one knows how to make the braids, just looking at the photo is enough. (more Sulawesi bag illustrations can be seen in L-M BRIC issues 8 and 9)]; Notes and references. L-M BRIC no. 10, 2007 – Guajiro [Wayuu] loop braiding (Colombia and Venezuela): 12 or more braids, indications that the Wayuu make multiple-braider braids; ‘Kaku-hira-uchi Braid Fragments,’a pair of unusual Japanese national treasure braids from 1185-1333 just revealed to the public; Loop-Manipulation Braids on a Fifteenth-century Purse; Xi – Lace-like [braided] Fabric Fragments from the Warring Period (402 BC-221 BC) M.Kinoshita’s report regarding research by Mari Omura et al on braided textiles from tombs in Hupei province, China. [structure = plain oblique twining/ POT]; Modern Attempt at Making a Medieval Fingerloop-Braiding Booklet; Notes and references. L-M BRIC no. 11, 2008 – Finnish Finger-Held Loop-Manipulation Braiding Operated by the Small Finger [including 9-loop braids made using thumbs as well as fingers]; Mari Omura: Braids in Chinese Classics And Excavated Braids from the Warring States Chu Cemetery [note 11]; Yi people loop-manipulation braid [needlecase], Sechuan, China; Idiosyncratic Appearances of Braids with an Unorthodox Pattern; Young People Enjoying Braiding. Notes and references. Illustrated Instruction Series Issue 11 – Japanese version 日本語版 – Fingerloop Braiding with 9 (and more) Loops, Using Method 2. L-M BRIC no. 13, 2010 – L-M in Yao Country, Yunan, China; Book review of European Loop Braiding: Investigations and Results Parts I and II; Index for L-M BRIC News, no.s 1-12. The guide above is my personal index to L-M BRIC and its associated Illustrated Instruction Series. Loop-Manipulation Braiding Research and Information Center News is Masako Kinoshita’s 13-issue online compendium/ annual newsletter on loop braiding worldwide history and practice. It ran from 1998 to 2010 in Japanese and English versions. The Illustrated Instruction Series was a related/subsidiary series of (usually shorter) how-to notes and articles. Most of them accompanied a specific L-MBRIC issue. (A link to the accompanying Illustrated Instruction issue is usually located somewhere near the end of each LMBRIC issue. There are no links to any of the Illustrated Instruction issues on L-MBRIC’s home page.) Contact me if you are trying to understand something in one of the illustrated instruction series – they can be hard to understand if you haven’t memorized M. Kinoshita’s terminology and acronyms (hint – start with her first illustrated instruction articles). My contact form is under my “ABOUT” tab, upper menu. Masako Kinoshita published these two series on a yearly basis from 1998 to 2010. They are an amazing fountain of information about loop braiding practice and history worldwide. All the issues have interesting information, much of it not available anywhere else. The two Illustrated Instruction issues on Kute-Uchi are especially important, as there is so little information about kute-uchi available anywhere, outside of Masako Kinoshita’s very hard-to-find and expensive book on it, which is almost entirely in Japanese. Even many of the articles on European loop braiding contain information that is hard to find anywhere else, along with references to the often obscure sources. Unfortunately, the content of LMBRIC is not easy to navigate. There is no table of contents in the beginning of any issue, or on the introductory/ home page (www.lmbric.net). None of the articles has its own url, you can only bookmark a whole issue. In her final issue of L-M BRIC, Masako Kinoshita included an index to all the articles in the series. It’s located near the bottom of LMBRIC no. 13. The articles are listed in order of date published, not alphabetically or by subject, with a link to the issue in which they can be found. My guide above is similar, but it groups the articles by issue, rather than as a stand-alone list. I itemize each Illustrated Instruction issue immediately after the L-MBRIC issue it relates to. Two important Illustrated Instruction issues have no obvious connection to any particular LMBRIC issue. I list them first — that is, following the link to LMBRIC’s introductory/ home page but before Issue #1. 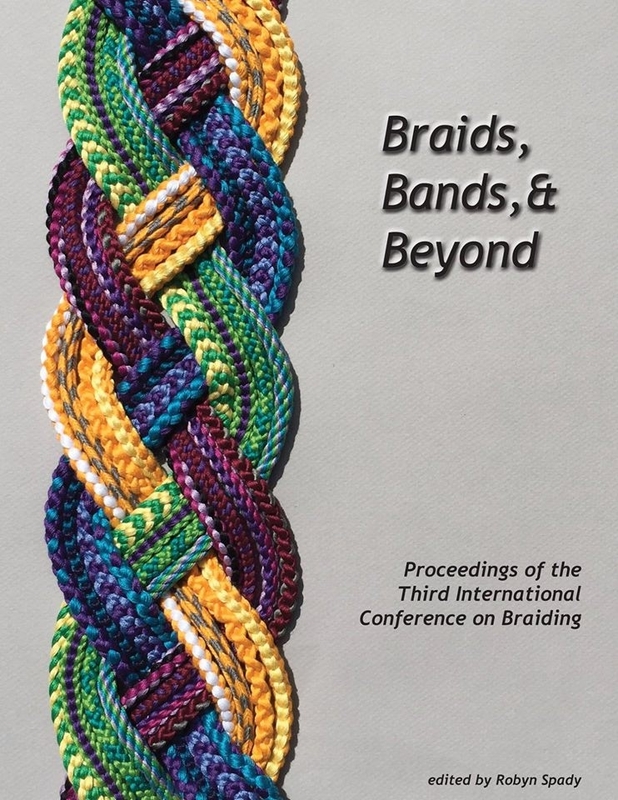 *Some of Mari Omura’s historical and archeological research on loop braids in Asia is reported in the Proceedings books from the first two international BRAIDS conferences: Space, Time and Braid (2007), and Threads That Move (2012). Check with the Braid Society in England, and Braiders Hand in the U.S.